Hans Keilson was a German novelist who fled the country in 1936 for the Netherlands where he later went into hiding. He was rediscovered in English with the publication of translations of two novels dealing with his war-time experiences in 2010 and 2011, Comedy in a Minor Key and The Death of the Adversary. 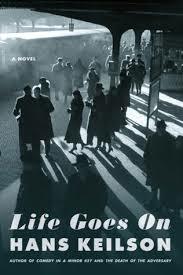 Life Goes On is his first novel, published in 1933 and translated by Damion Searls in 2012 for US publication. The novel focuses on a Jewish family modelled on Keilson’s own: the shop owner Herr Sederson, his wife, a daughter who has already left home and the younger son, Albrecht, presumably based on Keilson himself. What is unusual about the novel is that, although in some ways it unfolds as the traditional Bildungsroman, much of it – and I would argue, the most interesting part of it – is taken up with the father’s story. More than once Sederson comes up with a way of reducing his debts, but the hope this creates rarely lasts long. It is to some extent in the background that Albrecht grows up; more interesting is the story of his friend, Fritz. Desperate to leave school and make his way in the world, he runs away from home to find work, at one point ending up in America. However, the economic down-turn defeats him again and again. Keilson’s point seems to be that hard work is not necessarily enough, whatever politicians may tell us. It is Sederson and Albrecht’s political awakening that provides the novel with its conclusion. Initially their participation in a Communist rally was to be quite clear, but, at the suggestion his publisher, Keilson left the nature of their politics ambiguous. What remains, however, is the implication that we might ignore politics, but it does not follow that politics will leave us alone, a premise that was to be proved tragically correct in the years that followed. This novel provides a gripping picture of the stresses and dramas of running a small business in difficult times, an antidote to the idea that success requires no luck. It also demonstrates the dangers of political apathy. Keilson’s father and mother were both murdered at Auchswitz. You are currently browsing the archives for the Hans Keilson category.